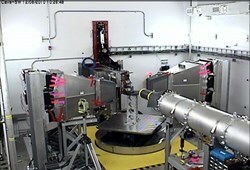 The VULCAN experiment chamber with the superconducting cable sections on the table in the center. Scientists and engineers at the Spallation Neutron Source at Oak Ridge National Laboratory are working with the US ITER Project Office at ORNL, the Japanese Atomic Energy Agency and the ITER Organization to resolve issues with a critical component of the experimental fusion energy facility ITER. The VULCAN Engineering Diffractometer at SNS is being used to examine superconducting cables for ITER's central solenoid magnet, which induces the electrical current needed to confine and shape the plasma inside the reactor. ITER is the international research facility in southeastern France whose mission is to demonstrate the feasibility of fusion as a practical long-term energy source. SNS, located a few miles down the road from the US ITER Project Office, is the world's most powerful pulsed neutron source. Ned Sauthoff, US ITER project manager, said the VULCAN measurements have provided useful data and that VULCAN will have a role in the continuing investigation. "Having seen the initial results, I think we have sufficient evidence to state that initial measurements have demonstrated the capability of VULCAN to measure important material properties, that meaningful results were achieved, and that the team is now focused on using the unique capability to gain important understanding aimed at solving the problem," Sauthoff said. The central solenoid, a joint Japan-US ITER responsibility, is on a tight schedule. The superconducting cables, supplied by Japan, cost more than $3,000 per metre. Improving the cable performance by reducing the degradation of the superconducting strands is important to staying on schedule and on budget. "We are working on an important problem that will have an immediate impact on science and technology on an international scale," said Ian Anderson, head of ORNL's Neutron Sciences directorate, which operates SNS. The team of Japanese, US and ITER Organization engineers discovered in late 2010 in a sample test that the superconducting cables making up the central solenoid magnet at the core of the ITER design were losing their current-carrying capacity over time to an extent well beyond that experienced in an earlier ITER model coil test. The cables can generate a magnetic field as strong as 13 tesla, and the electromagnetic (Lorentz) force exerted on the wires by the high magnetic field and powerful current is known to cause some degradation over a period of constant magnetic cycling. The exact cause of the degradation in the conductor sample is unknown. In addition to the Lorentz force, it may also be attributable to the sample manufacture or the particular sensitivity of the wires to the loads. The magnet team at the US ITER Project Office in Oak Ridge consulted with scientists at SNS about using neutron scattering to examine the states of materials inside the cables. The samples examined at SNS are sections 1.65 inches in diameter and several inches in length cut from the much longer cables. The cables have a complex structure—copper wires interspersed with superconducting wires of a niobium-tin alloy, all contained in a stainless steel tube. 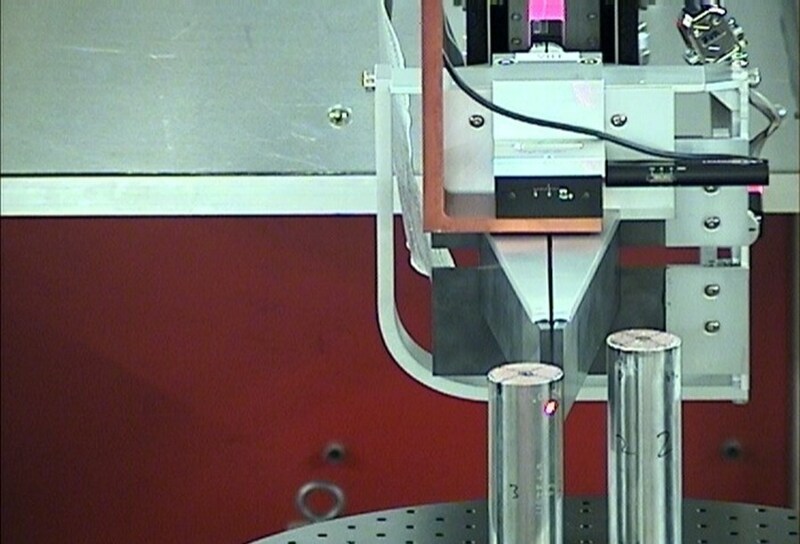 Neutrons are highly penetrating and nondestructive, so neutron scattering can return detailed data about the structure of the cable sections without destroying or altering them. SNS is the ideal facility for studying the thick cables because it has the most intense neutron beams of any pulsed neutron source in the world, said VULCAN instrument scientist Xun-Li Wang. And VULCAN is the ideal instrument because it is designed to handle large industrial-sized specimens, rather than small lab samples. The multi-phase material making up the cable is perfect for characterization by a time-of-flight diffractometer such as VULCAN, Wang noted. "Neutron diffraction is a well-known technique for mapping strain or stress in engineering materials." "With VULCAN we will be able to determine the deformation induced by the Lorentz force," he said. "On a fundamental level, we can also study in detail how the critical current in a superconducting wire responds to applied stress and develop a predictive model for the wires." A plan for future study is being developed with the Japan Atomic Energy Agency, which is responsible for central solenoid conductor fabrication, and the ITER Organization.